Manchester United put down a huge marker in the Premier League title race as Robin Van Persie's late free kick sealed a dramatic 3-2 Premier League derby victory at Manchester City's Etihad Stadium fortress on Sunday. City had fought like tigers to fight back after Wayne Rooney's first-half double but goals from Yaya Toure and Pablo Zabaleta proved in vain as Van Persie marked his first Manchester derby with the stoppage-time strike that took United six points clear of their opponents at the top. Everton also scored twice in added time to beat Tottenham Hotspur 2-1 at Goodison Park, Nikica Jelavic's decisive goal sending Everton back into the top four. 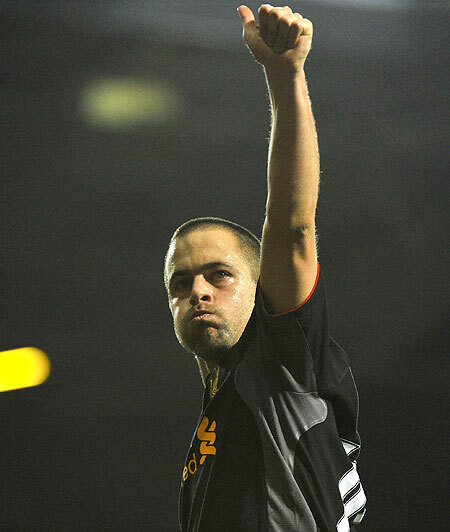 West Ham United were haunted by former players as Glen Johnson and Joe Cole scored in Liverpool's 3-2 victory at Upton Park as the Merseyside club moved into the top half of the table for the first time this season. United's victory made up for the two league defeats they suffered against City last season when Roberto Mancini's side won the title for the first time since 1968. However, it was marred by an ugly incident immediately after Van Persie's deflected free kick had beaten Joe Hart when a celebrating Rio Ferdinand was struck by an object thrown from the City fans and suffered a cut to his face. "It's unfortunate that a City fan runs on and coins are thrown. That shouldn't happen. The same thing happened at Chelsea, which was masked by all the other things. We could have done without that," United manager Alex Ferguson told the BBC. Ferguson preferred to revel in his side's performance which ended City's unbeaten start to the season and snapped their two-year unbeaten run at home in the Premier League. "You couldn't take your eyes off it today, it was so engrossing. It tells you about the quality of the Premier League, it's such a great league," Ferguson said. Rooney put United ahead after a 16th-minute counter-attack ended with him scuffing a shot low into the corner. It was not the sweetest connection but made the 27-year-old the youngest player to reach 150 Premier League goals, a feat only managed by Thierry Henry, Alan Shearer, Robbie Fowler, Andy Cole and Frank Lampard. Rooney made it 2-0 in the 29th minute with a cool finish after fine link-up play between Rafael and Antonio Valencia. 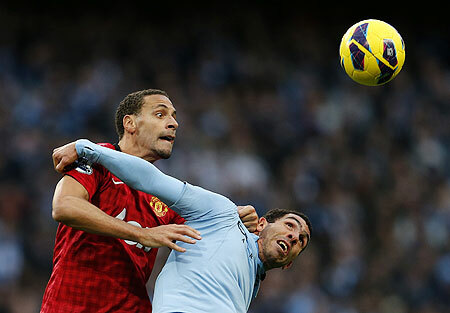 It was clinical by United and City, who had also lost centre back and skipper Vincent Kompany to injury, appeared deflated. Mancini lost patience with striker Mario Balotelli seven minutes into the second half, replacing him with former United striker Carlos Tevez. While Balotelli went off to stew in the dressing room, the game suddenly changed in the space of a minute on the hour. Ashley Young was wrongly judged offside as he slotted into an empty net after Van Persie's shot hit the woodwork and City immediately went down the other end where Tevez showed great composure to set up Toure to fire past David De Gea. Belief flooded back into the City ranks and Zabaleta's thumping finish made it 2-2 in the 86th minute and even raised home hopes of an unlikely victory. Van Persie had other ideas, however, and stepped up in stoppage time to fire a free kick past Hart with the aid of a slight deflection off Samir Nasri. Tottenham were heading for a fourth consecutive league win that would have cemented their place in the top four when Clint Dempsey opened the scoring at Goodison Park with 15 minutes left. Everton, beaten only twice in the league this season, equalised with a header from former Tottenham player Steven Pienaar before Jelavic poked home the winner. Liverpool were without Luis Suarez, their only genuine striker for the trip to West Ham, but proved they can prosper without the Uruguayan. Johnson's piledriver put Liverpool ahead in the 11th minute but West Ham were in front by halftime through a Mark Noble penalty and a Steven Gerrard own goal. Cole's composed finish levelled matters after 76 minutes before Jonjo Shelvey, another player who learned his trade at West Ham, went through on goal with 10 minutes left and forced James Collins into the game's second own goal. The Rediff Election Chat: Which way will Gujarat vote? Is it the beginning of the end of Zaheer Khan's career?